The Balinese Temples are unique in architecture and strecture and are built according to specific rules. The traditional religion is takes an entire part of the life in Bali. That is why you should not miss the opportunity to watch closer this aspect of the Balinese culture and admire the different temples around! As we are talking about religious places, pay attention to what you wear and get some decent clothes on. 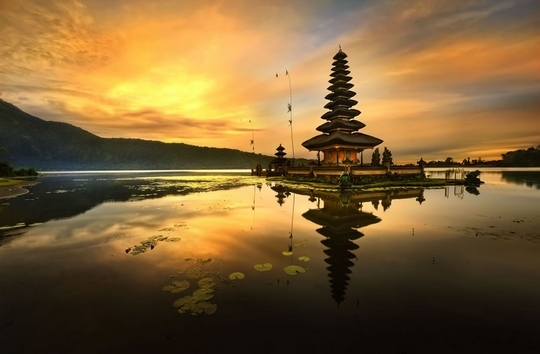 We have shortlisted for you 3 fantastic temples to visit during your trip in Bali. Goa Lawah is also known as bat cave. It is called Bat Cave because of the two large, majestic banyan trees at the main entrance. It is a very important temple for the Balinese Hindu community. 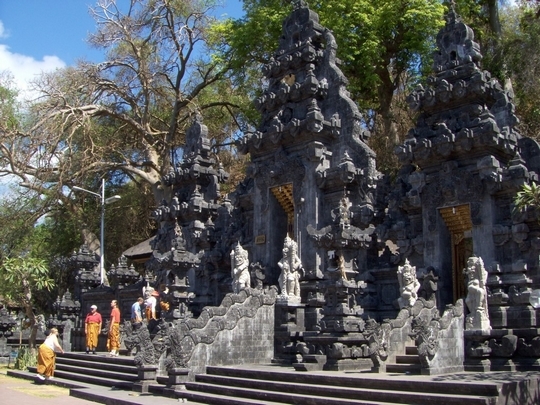 Goa Lawah is one of the most important temples you can find in Bali. Located at the South East coast of Bali, you will find such beautiful black sandy beach. 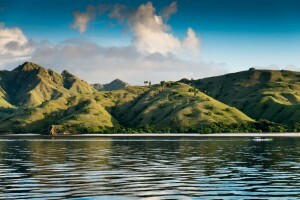 And from here you will be able to see the horizon of the coast of Nusa Penida. It is very common for tourists and locals to stop here and give offerings. Here are some tips for you if you visit the Bat Cave Temple! According to some tales, the cave has a pathway up to Besakih Temple in the North, at the foot of Mount Agung. You can go in the morning and pray with the locals. 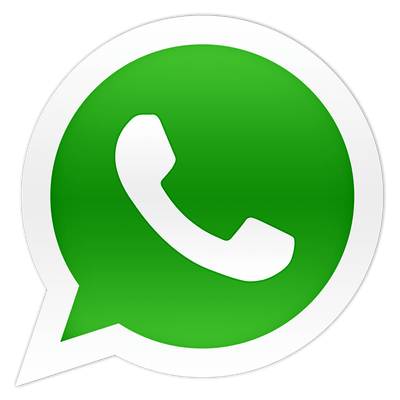 It is used to be a busy place thanks to its popularity and its access. So you will definitely enjoy visiting this temple! This cliff-top temple is quite impressive once you get there. 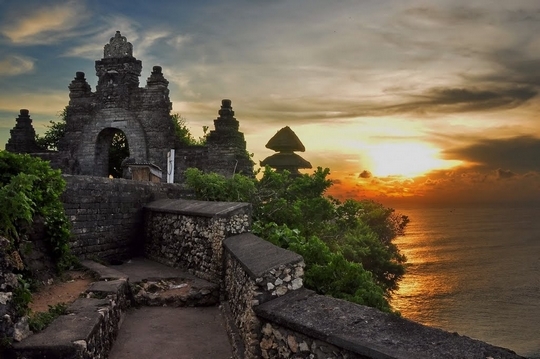 The temple is built on the steep cliff, and coming at this temple would make you feel like sitting on the throne of Bali. During sunset hours, the atmosphere fers literally enchanting. 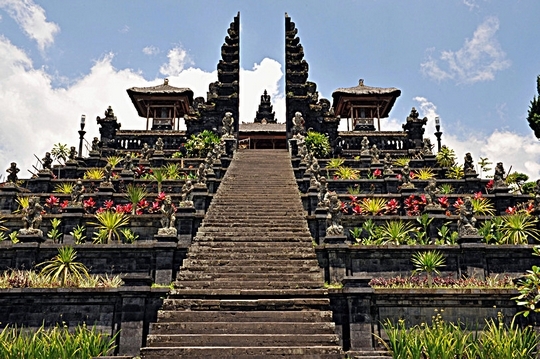 It is one of the nine key directional temples from Bali. You have the possibility to enter to the temple area through two entrances. They are both surrounded by a some Ganesha sculptures (shaped like a human body with an elephant head). Behind the main shrine lies a Brahmin Statue facing the Indian Ocean. The temple might not look as spectacular as the other ones, but the location makes it unique: it is perched on a steep cliff 70 meters above the roaring Indian ocean waves. There are more steep headlands on either side and sunsets over Uluwatu so you should definitely enjoy your trip over there. With a scenic cave underneath and a beach close to the temple, this is the perfect spot for surfers! You would also be able to watch a Balinese Dance Performance in the evening and although it can be a bit crowded at times or feel a bit touristic. 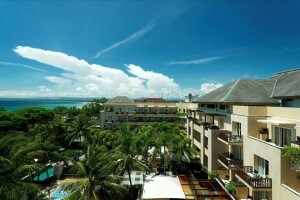 But you will still get the Balinese touch and enjoy really enjoyable views. Watch your belongings though if you go to this temple, with all the monkeys around used to steal tourists stuffs! It literally means “head of the lake” which reflects not only the temple location, but also its importance and main purpose. The temple compound is composed of nine different smaller temples. There are almost 30 different shrines dedicated to the gods and goddesses of springs, water, crafts, art and agriculture, and art. 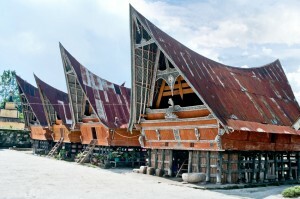 These things are definitely the foundations of the Balinese society and its culture. The Batur village is located down in the caldera at the foot of the volcano Mount Batur. You can visit the principal temple, Agung Batur, with its five main courtyards. As many important temples on Bali, considering the amount of tourists visiting the temples, the local devotees expect from the tourists a donation (around $1). But there is a lot to explore once in there. Besides the rice paddies and the agriculture, you can see the Bali’s unique irrigation system (called Subak) controlled from the top of the volcano. Take your time to feel how unique is this temple site! If this list of temples do not appeal to you, you can still find some other Balinese temple like Pura Luhur Lempuyang, Gunung Kawi Temple, or even Ulun Danu Bratan, one of the most important water temple around. So hurry and book your trip to Bali right now! Have you already planned your whole trip to Indonesia? 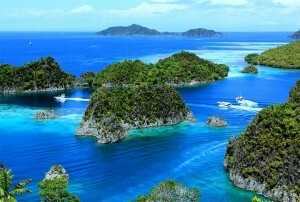 Or, are you dreaming of travelling to Indonesia very soon? Well, if that is the case you have to know that June-July 2016 (from June 6th to about June 7th, 2016) is dedicated to Ramadan. I already talked in my previous article about religions in Indonesia, but just a quick reminder, about 88% of Indonesian are Muslims! Thus, it is important to know that you may have to tweak your travel itinerary a bit as well as respecting some cultural norms to avoid offending locals. But before we dive in going to Indonesia during Ramadan, what is Ramadan? Ramadan is one of the five pillars of Islam. It is a month of fasting that lasts between 29 and 30 days depending on the appearance of the moon. Ramadan dates mainly rely on the Lunar Calendar. The time moves backwards ten days every year. 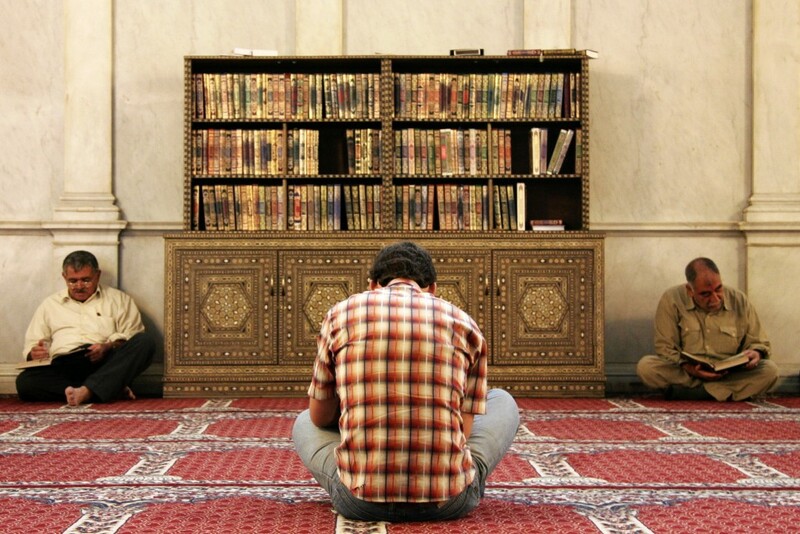 The name Ramadan comes from Arabic heat, burn, or lack of provisions. The month of Ramadan celebrates the fact the whole sacred book, the Qur’an was brought down on earth during that month. During this holy month, Muslims do not eat, smoke, drink water or even any sexual relations during the day between the first prayer of the day (about ½ hours before sunrise) and Maghrib (sunset). Suhoor is the morning meal eaten before the first prayer and Iftar the meal eaten after the sunset to break the fast. It is not only about fasting and not eating all day, but it is also a month during which Muslims have to build healthy habits, restrain bad behaviour and be more mindful of others. This could go from participating in charities to donating a small amount of money every day. What about Ramadan in Indonesia? As some cities are mainly populated by Muslims, you will find that several stores and supermarkets close during the day. Some even decide not to open at all during the whole month of Ramadan. There are several local particularities to doing Ramadan in Indonesia. First, Eid-Ul-Fitr the celebration after the month of Ramadan is called Lebaran. If the Indonesian Muslim is an employee, he will receive the THR (Tunjangan Hari Raya), a compulsory reward that should be given to any Muslim employee. Which regions are more involved in Ramadan? As you can see in my previous article, Bali is mainly Buddhist and Hinduism. You won’t have any issues travelling around Bali. Everything will be open from restaurants to shopping malls. Other regions activity that won’t be significantly affected in Indonesian regions which as are mainly Christian (Sulawesi, Batak in northern Sumatra, and especially the eastern part of Indonesia – see the map). Also, Any places such as China towns won’t also be observing Ramadan. Indonesian Muslims usually go back home to see their family and celebrate Lebaran (the end of the month of Ramadan). What does it mean for you? It means that trains, flights and hotels may be overbooked. Some prices may also go up even though several hotels offer special offers and promotions during Ramadan in Indonesia so you can still get good prices. But booking in advance is necessary to ensure that you will have somewhere to sleep. Another thing you can do is travel to non-Muslim areas like Bali or maybe the Gili Island during Lebaran. In order to respect Indonesians observing Ramadan, it is better to avoid drinking and eating in public. If you are in a hotel, it is ok as it is part of their job to give you food. Besides international hotels, you won’t find any alcohol during Ramadan. Instead of drinking some beer why don’t you try a typical local Ramadan, Lebaran, a delicacy called the Ketupat? The Ketupat is made with palm leaves wrapped around some rice. Also, try to go early for dinner around maybe 6 pm to avoid the crowd of Muslims going to restaurants to eat Iftar (meal taken after breaking the fast). If you want to enjoy the great atmosphere, you can try to find a seat and eat at Sunset. Finally, have fun and don’t worry because most attractions and hotels are still operating! Are you planning on travelling to Indonesia soon? 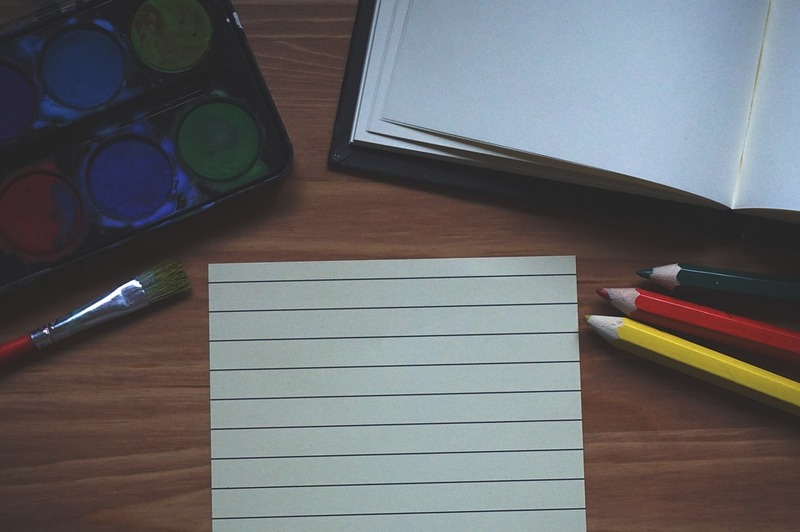 Well, before going to a new place, you have to gather some information about the local culture. 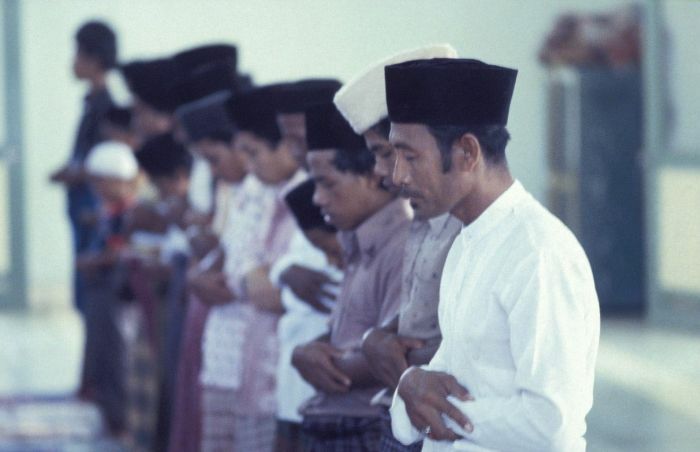 Religions are prominent in Indonesia and integrally makes part of Indonesian daily lives. Indonesia has seen waves and waves of immigrants coming to either take control of the country or to find another land to live in. Before that happened, Indonesia was inhabited by prehistoric human beings. 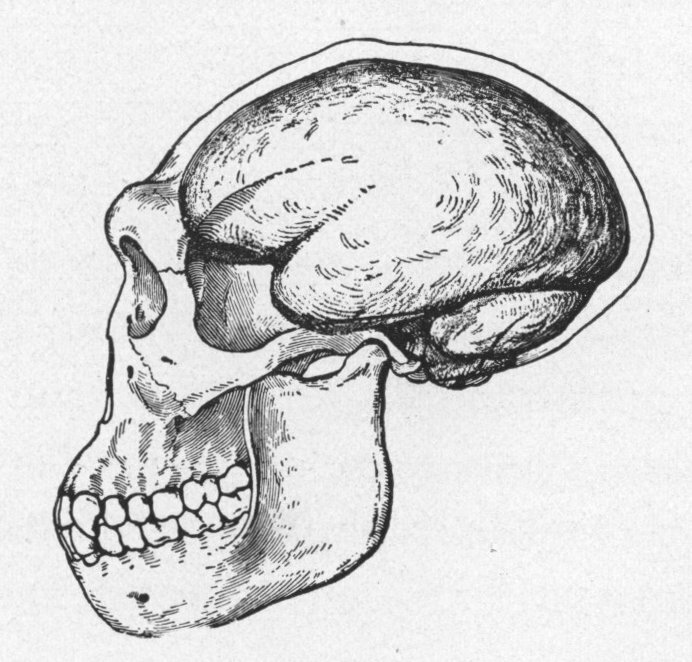 In 1890’s, researchers led by Eugène Dubois discovered a Homo erectus also known as the “Java Man” in Central Java located in Sangiran, Indonesia. They found several parts such as a tooth and a skullcap. Sangiran is known for being the source of more than 80 species. The whole migration history started around – 28,000 BC and then went on with the massive arrival of nationals from India, China, Cambodia, Arabic countries, Britain (1800’s), and Dutch (1600’s). Needless to say, Indonesia has faced several cultural shocks throughout the years and got used to the phenomenon of acculturation. Acculturation refers to the adaptation which can go to merging between two ethnic group / person of originally two different cultures. Of course, this acculturation mainly happened on the Indonesian side rather than the migrants. 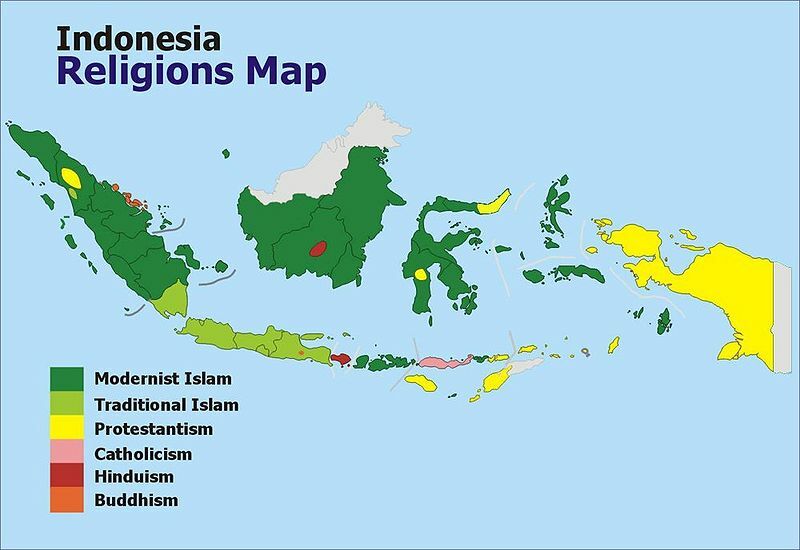 Indonesian inhabitants history led to the creation of a diverse religion landscape and the cohabitation in the harmony of more than 6 different religions. 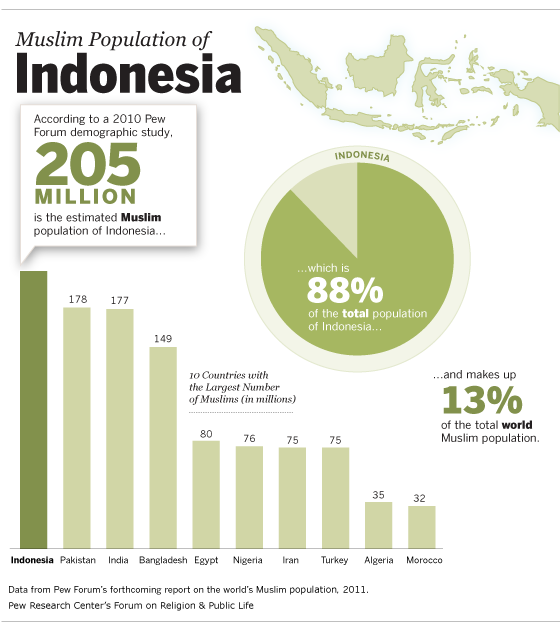 As you can see on the graph below, Indonesia in mainly a Muslim country with almost 9 out of 10 Indonesian being Muslims. You then have 5% of Christian Protestants, 3% of Roman Catholic, 2% of Hindus, 1% of Buddhists and 1% of other traditional religions. According to Pew’s data, there are 205 million Indonesians who are Muslims which means that Indonesia is actually the biggest (in terms of volume) Muslim country in the world accounting for 13% of the world Muslim community. 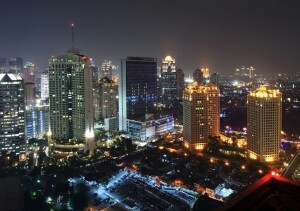 International trade has always been a major part of the Indonesian economy. Import/Export activities started with Arabs in the 4th century but it was only business no invasion or takeover. In the 13/14th century, Arab merchants coming from Gujarat in India and Persia came in Indonesia and started to spread Islam across the country. Geographically speaking, it started in coastal Java (where the trade occurred) to Sumatra and then northern of Central Java. Some kings even decided to convert to Islam such as the King of Demak. The king of Demak was at the origin of the wide propagation of Islam in Indonesia across the kingdoms. Two Islamic movements occurred in 1912 and 1926. It should also be noted that there are two “types” of Islam in Indonesia. 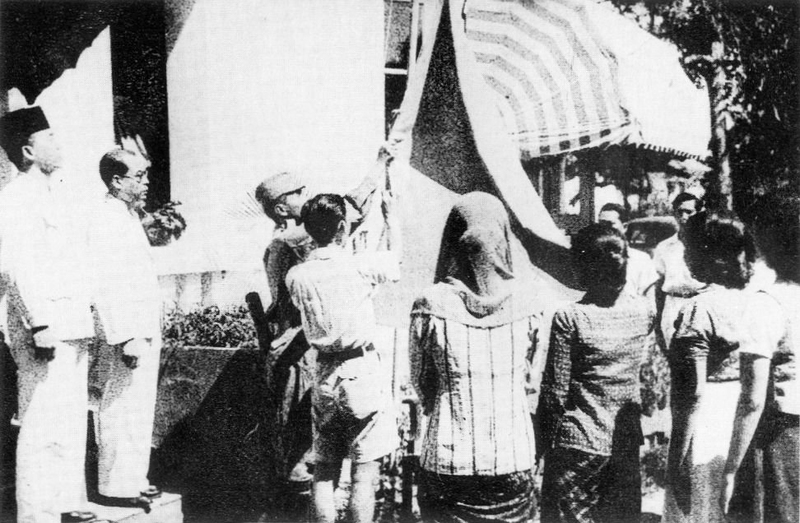 The “Traditional Islam” and the “Modernist Islam”, as explained by Martin Lewis, from Geocurrent, “the distinction is entirely different, with “Traditional Islam” meaning the Javanese custom of melding Islam with earlier Hindu and animist ideas and practices, and “Modernist Islam” denoting orthodox expressions of the faith.” Traditional Islam also known as Abangan Islam is predominant in Central and East Java while Modernist Islam also called “Orthodox Islam” is expanding in urban areas and touches younger people. Borobudur Temple Yogyakarta, Java, Indonesia. Both religions Hinduism and Buddhism lived simultaneously without really fighting against each other. 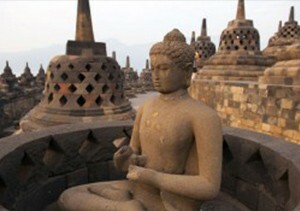 The Indian Buddhist travellers were the first foreigners to land in Indonesia in the 1st c. AC. 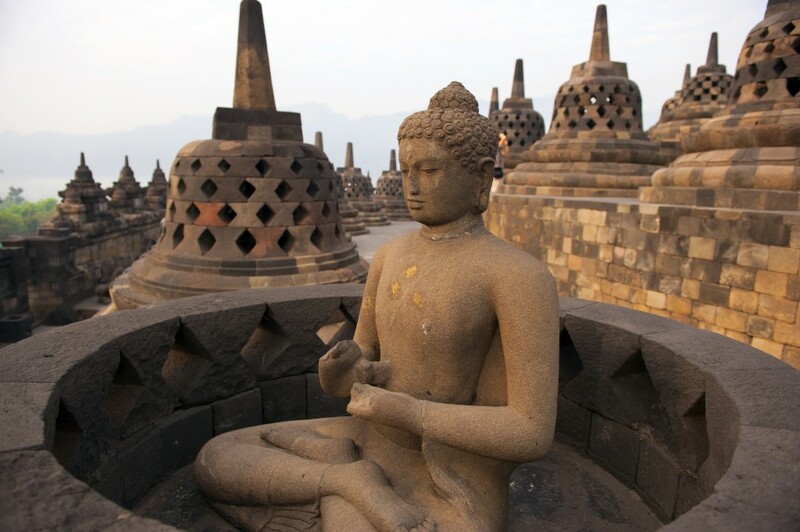 In the 4th century, Hinduism started to expand in Indonesia particularly in Java and Sumatra. The temple of Borobudur was founded in the 9th c. and is a worldwide treasure known for its important role in the Indonesian Buddhism culture. Several Hindu and Buddhist festivals are held there. Concerning Buddhism, as you may already know, there are two types of Buddhism: Hinayana and Mahayana. Both were transferred to the Indonesian Culture even though Mahayana is the most famous one in Indonesia. The Indonesian Buddhist Association stated that more than 90 monasteries were built since 1960’s. What about the famous Bali? 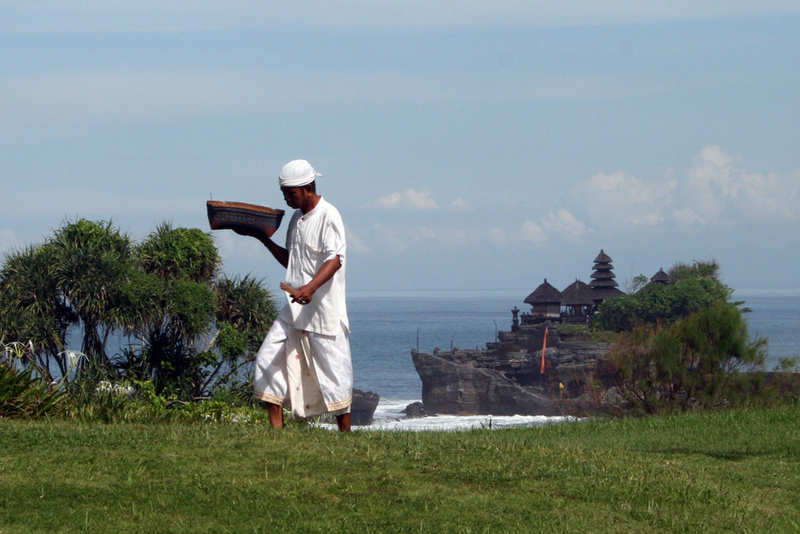 Bali is mainly an Hindu-Buddhist island. Finally, we have Christians. It all started in 1511 when Portuguese started their invasion of Indonesian islands and spread Catholicism. The Spaniards also helped and certain regions such as the Moluccas were mostly converted to Christianity. About 70 years later, Dutch in search of spices to sell to their European neighbors, established in Indonesia and spread Protestantism. 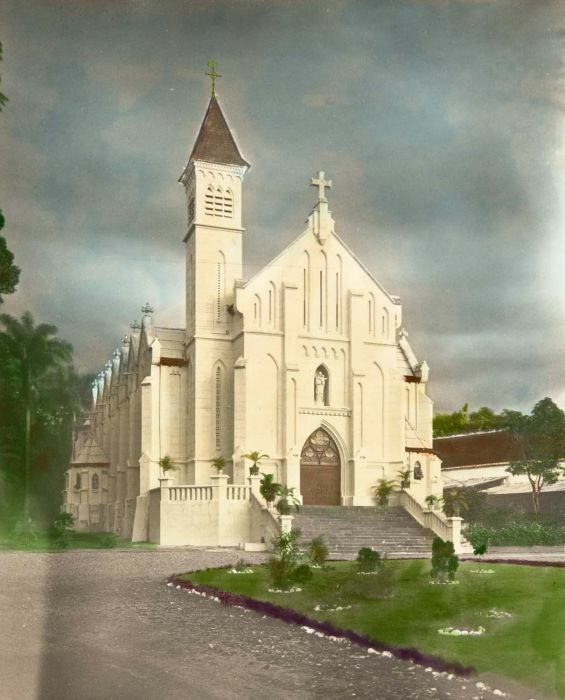 Christianity continued its travel in Indonesia until the declaration of Indonesian Independence in 1949 from Dutch colonisers. Unlike some other countries where religions are constantly fighting between one and another, Indonesia is lucky to be one of the tolerant countries in the world. 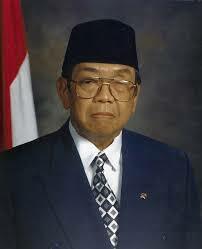 One advocate of religion tolerance was Gus Dur, former head of the Muslim organisation and president. During his presidency (1999-2001), he declared the Chinese Lunar New Year to be just like any Muslim holidays, an official day. He also undertook several other actions to relieve tensions, bring more harmony and peace to former conflicts. 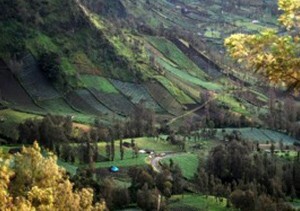 As you can see the Indonesian landscape is diverse and unique. Visiting Bali or Indonesia, should not only mean going to the beach but also enjoying the multiple wonders left by each religion.